This is a commission slot. You can hire Ashita to create a personalized artwork of this sort here. The artist will most likely respond to a request within the same day. This commission slot was rated positively by 61 clients thus far. Very quick to answer, easy to work with, and very good quality! Overall, a pleasant experience! Will recommend! I am very very happy with this piece! Artist was very prompt, kind, and professional. Beautiful work. I will definitely commission again in the future! Ashita is such a sweet-hearted and kind individual. I recommend her and her adorable art style 100%. Amazing and friendly artist. The product was adorable just as much as my first order and the background is very detailed! 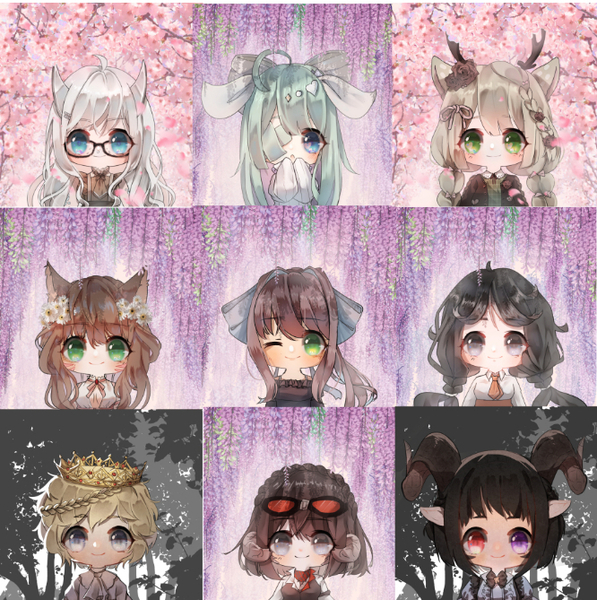 Cute chibis, cute artwork and great artist! very good artist?comlete drawing in only 2 day ~ will comission again in future ? Artist was a pleasure to work with^^ they understood what I wanted and I love the final piece! Such a wonderful artist to work with lovely art to show for it, kept me updated with every bit of the way. Would recommend time and time again. Thank you for amazing piece of art! I am happy with the outcome and look forward to using my new avatar in game and forums. Met earlier date from deadline and was pretty nice overall :D Tysm!! Fantastic job and cute as ever. This is my second one and I look forward to getting more work done in the future. Great artist, great communication. Will definitely request more work in the future. Can’t go wrong. Great artists, works quickly, and delivers fast, also makes quick changes and is patient. Wonderful artist, delivering the utmost high quality and effort. Able to accommodate all my changes and was very communicative. Highly, highly recommend. Completed the job quickly and smoothly, no issues! Really great artstyle. Delivers pretty fast as well. Very friendly artist with beautiful colouring and shading. I was specific about what I wanted and I got exactly that with no difficulty. Amazing art, good communication, definitely worth the price I paid! Fast, kind, and overall great work! Super friendly with each step and the art is incredible, especially for the price. Will definitely look here for commissions in the future! Did a cellshade commission instead of a chibi icon this time and I really love the way Ashita made it. Thank you so much once again for paying attention to the extra little details and for the wonderful art! Super sweet with an amazing art style. I def recommend! This artist was quick and great at their job. They followed instructions and always got back to me within a day. Highly recommended!